When it comes to the way the Kalash people dress, it is usually the female clothes that grabs someone’s attention. 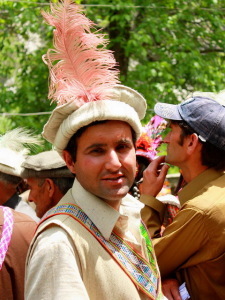 Kalash men have abandoned their traditional goat-hair tunics for shalwar-kameez, the pajama-like outfits worn throughout Pakistan and Afghanistan. 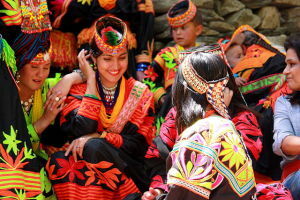 But Kalash women still wear cheos, baggy black cotton dresses brilliantly embroidered at the collars, cuffs and hems. Glass beads drip from slender necklines. Long head-dresses are decorated with regimented waves of cowrie shell and elaborate embroidery, with blood reds, shocking pinks, Byzantine blues, canary yellows and emerald greens woven together in kaleidoscopic tapestries. Colourful wool headdresses cascade to the women’s shoulders. These kupas are packed with tight rows of cowry shells brought from the Indian coast. The shells are believed to embody prayers for fertility. Unlike many Muslims, Kalash women remain unveiled and are famous for their beauty.